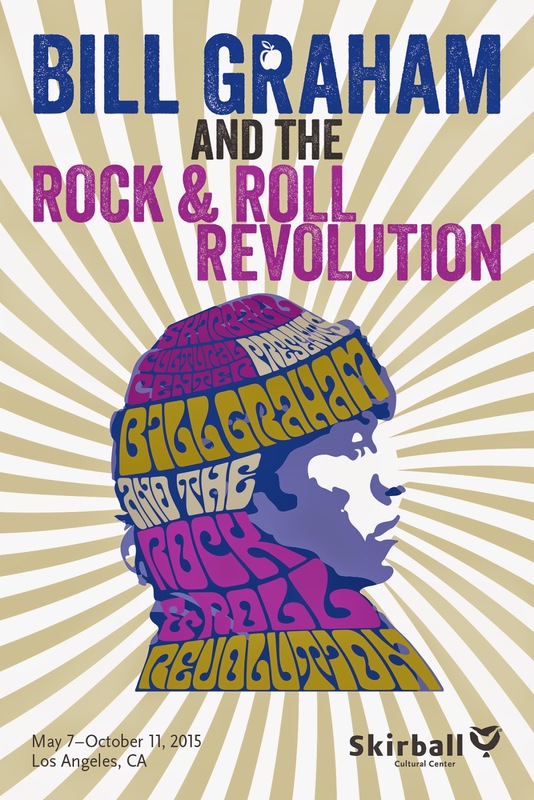 Bill Graham And The Rock & Roll Revolution show opens today at The Skirball Center. If you are a lover of the rock and roll, you want to check this one out for sure. We heard a little speech from the Skirball people, who introduced Graham's sons, David and Alex, as well as Graham biographer, Robert Greenfield, and Bonnie Simmons, who runs the Bill Graham Memorial Foundation. It was excellent to have these Graham insiders there to peruse the exhibit with, as any time you had a question, they were all right there with the real story. There is also an app that you can tour the exhibit with, with all these wonderful rock stories told in Graham's own voice. As Greenfield said at the start of the tour, "Bill's voice is on the wall." Graham was a survivor of the Holocaust, and was an social justice activist all his life, which is one of the reasons this show is opening at The Skirball Cultural Center (before traveling on to San Francisco, Chicago, New York ...).The first thing you are greeted by at the start of the exhibit is a barrel of apples like Graham always had at the Fillmore, with a sign to "Take one, or two". "White Rabbit" was playing - perfectly - when we strolled in, instantly transporting us back to the days of peace, love, and total upheaval. Graham left Nazi Germany on a kindertransport train to France - where he and his friend would steal apples in order to survive (and maybe why he always had those apples at The Fillmore). Those children were then shipped to New York, where they awaited adoption. Graham was the last child chosen, which may have added to his empathy for others, and also to his grit and determination to get things done. Graham himself was never musical, but soon began a lifelong love affair with the American genre of rock and roll. 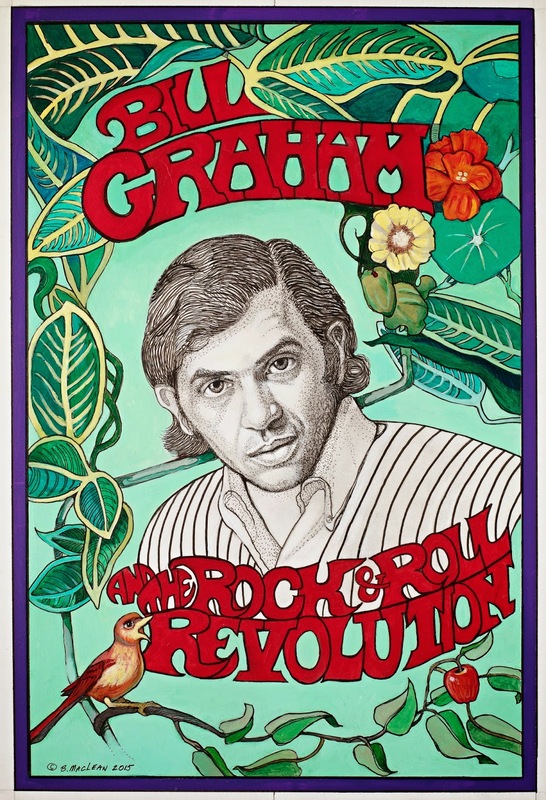 Graham never liked his original name (Wulf Wolodia Grajonca), as it was so hard for Americans to pronounce, so he chose "Bill Graham" from a Bronx phone book ... and never liked that either. Young Graham always wanted to act, so he found himself joining a mime troupe in San Francisco. In 1965, the head of the mimes was arrested, and Graham decided to set up an "Appeal Party" starring Jefferson Airplane to raise funds and awareness for getting the guy out. This would be the start of Graham's legendary concert promotion career - and also the start of all the great concert posters he was behind. The exhibit is divided up into decades, 60's, 70's, 80's ... with the treasures on display from each era. The 60's are all about The Doors, Jefferson Airplane, Janis Joplin, Bob Dylan, The Band ... it's just awesome. To see all the original posters of those legendary shows ... Man. The guitars on display from Graham produced shows were just sacred. 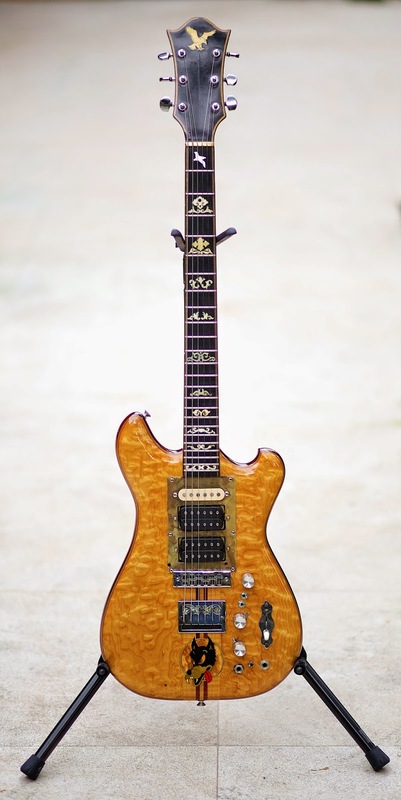 A guy near me was so overcome by Jerry Garcia's Doug Irwin Wolf guitar he kept saying how he felt lightheaded and had the chills. Rock and roll can do that to you. I felt almost the same when I saw one of Janis Joplin's show outfits on display ... and I was dressed pretty much the same, sans the boa. There is a piece of Jimi Hendrix's guitar, which is probably all that was left after he destroyed them with his genius. The Fillmore East and West were Graham's concert venues on both coasts, in New York and San Francisco. He maintained them both, flying back and forth every week, until 1971. With all the epically huge shows Graham put on, he would always say the best one he ever saw was Otis Redding. Hence, Graham was one of the first - if not THE first - to put both black and white artists together on the same bill. His goal was to have audiences that were 50/50 as well, and was a real pioneer in that area. Graham again pushing the social justice envelope. A highlight of the Fillmore East shows was always the Joshua Light Show, a trippy liquid light show that would transport revelers into a psychedelic space. They have recreated a Joshua Light Show in a room of the exhibit, and it was funny to hear an older woman comment, "It's not really the same, is it?" to her friend. I bet. A trip through the 70's was up next, through the good times and the bad. The next venue Graham opened up was The Winterland Ballroom, again in San Francisco, and again the place to be for the very best rock shows. ...As well as a huge photo of a massive crowd at a Stones show, along with the shorts and hat Graham would wear, and the broken heeled boots worn by Keith Richards. They had the suit Peter Frampton wore on his Frampton Comes Alive album cover, and was also worn in a show he did for Graham. It looks so crazy dated now, but at the time could not have been more fresh. Graham saw a great deal of need in the San Francisco Public Schools, so did a massive concert for his organization, SF SNACKS (Students Need Athletics, Culture & Kicks! 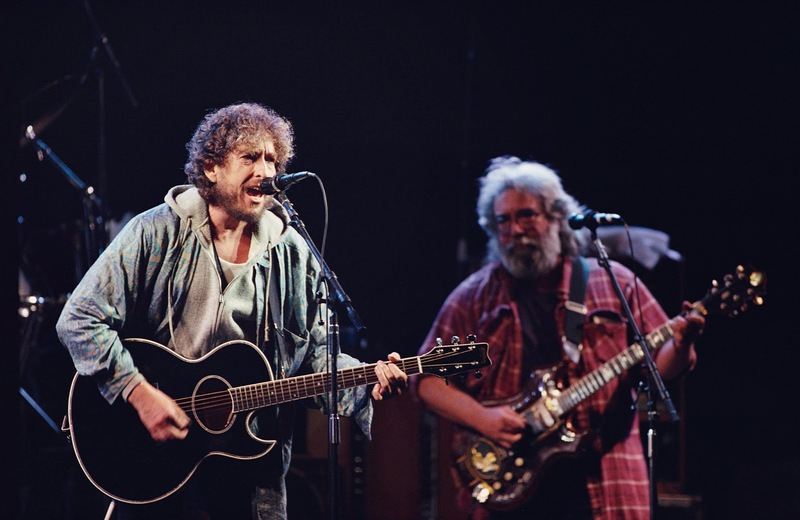 ), raising over $600,00 with everyone from Bob Dylan to The Grateful Dead playing for the kids. That was the kind of draw Graham had, and the kind of social awareness he raised. This was also the time of Days On The Green - one day outdoor festivals at the Oakland Coliseum, featuring acts like Led Zeppelin, The Eagles, Fleetwood Mac, The Who, The Grateful Dead ... all on one bill! Wow. Those were the DAYS. The 80's saw Graham keeping up with the times, and in fact, helping to create them. He produced the Live Aid show, that was broadcast to more than a billion people. This was the genesis of the huge modern day benefit show as we all know them. He grew with the artists, and actively booked all the latest acts, while staying true to the people that got him where he was. 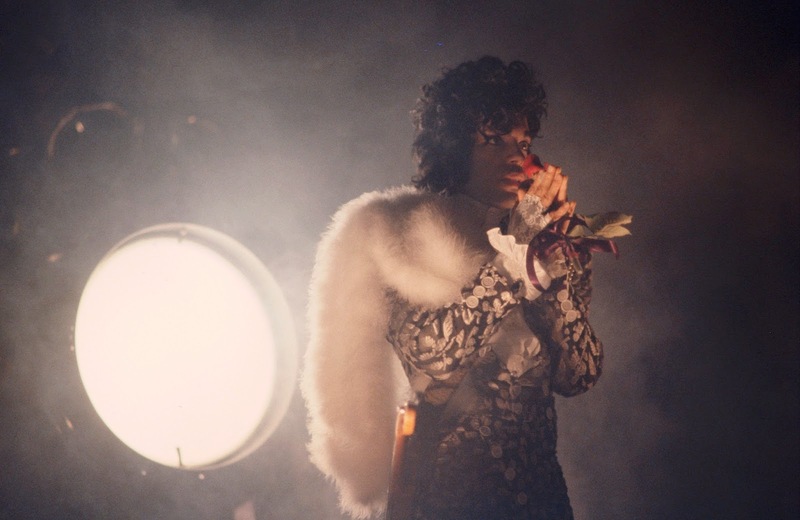 Soon his shows featured the likes of Madonna and Prince, as by now, Graham had created such a name for himself that everyone wanted to play his shows. Another year found Graham lording over the festivities as Father Time. You can tell as you walk around these wonderfully curated memories of the man's life, that he'd be a really good time to hang out with ... and a really good friend. 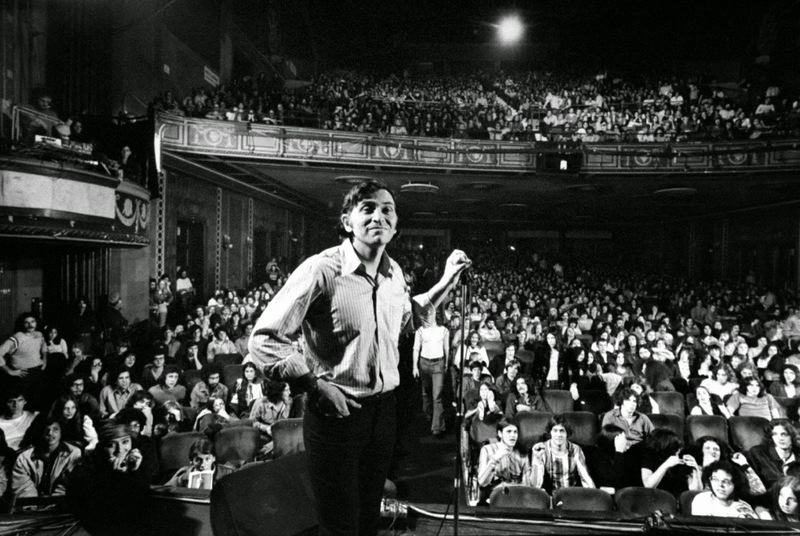 The concerts never ended for Bill Graham, as he was out producing them under the "Bill Graham Presents" banner until his last breath. On October 25, 1991, Graham caught a chopper ride back from a Huey Lewis concert to save time. There was bad weather, and they hit an electrical tower, killing them instantly. I listened to this story, and got kind of choked up watching Graham's sons, David and Alex, listening too, knowing that this was the moment that they lost their father. Graham was 60 years old, stopped short, with a lot of shows yet to envision. The outpouring of love at the Memorial for Bill Graham was overwhelming. Over 300,000 people attended the "Laughter, Love and Music" show that featured all of Graham's friends and colleagues like The Grateful Dead, Carlos Santana, Crosby, Stills, Nash and Young ... all there to celebrate the man who loved music. A story was told about how Graham taught the words to a Yiddish song called "I Love You Much Too Much" to Santana, who then played it at the Memorial. It was extra touching. As the sign at the end of the exhibit says, "It was the first time in history that so many people had turned out for a man who played no instrument, could not really sing, and had not written a word to any song. At long last, the crowd had finally come for Bill." I foresee a crowd continuing to come for Bill, as this show should be visited in droves by music lovers from around the world throughout its run at The Skirball until October 11, 2015. 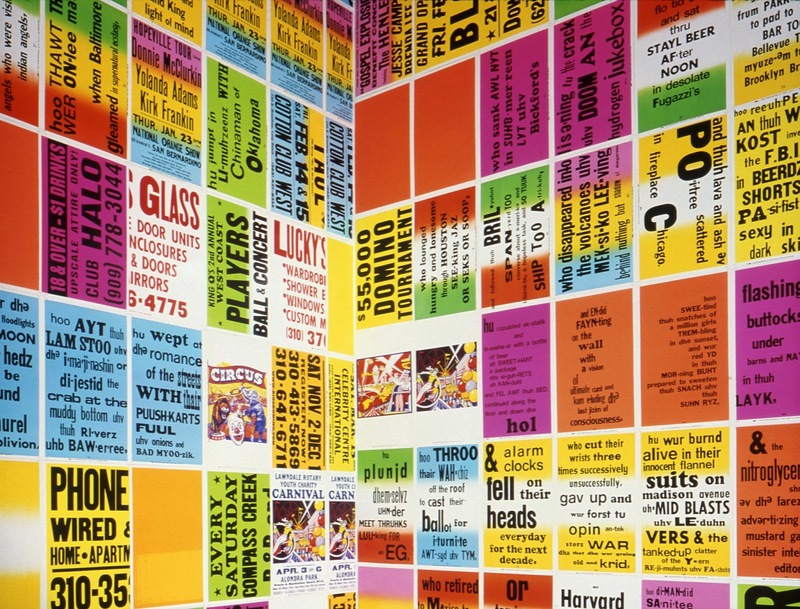 *Special mention must also be made about the great installation also up at The Skirball now ... The Singing Posters: Poetry Sound Collage Sculpture Book - Allen Ginsberg's Howl by Allen Ruppersberg. It's the entire Howl poem printed phonetically on posters, mixed in with pop culture posters, and meant to be read aloud. It is awesome, and should not be missed. **Photos courtesy of the Skirball Center (pro) and Me (phone). Help The Venice Skatepark Fund! Yo Santa Monica? 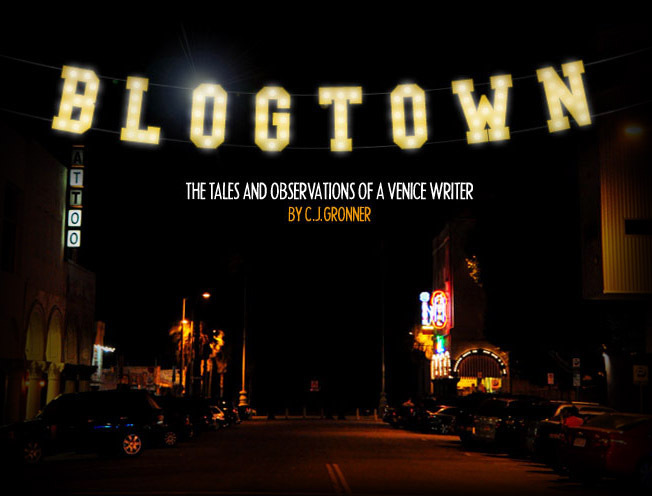 The Selling Of Yo Venice.